“On Trương Định Street, near my hotel. I went with Tuấn. In fact I was going to eat breakfast there today, before you sent Sương to pick me up. ” Sương was Hà’s waitress. I’d fled Hà Nội’s constant February drizzle and returned to sunny Huế, which I’d fallen in love with a few weeks earlier, but the rain had found me again. It sluiced down the hotel windows, rattling the panes and waking me up each morning. Sometimes my new friend Tuấn would pick me up on his way to Hà’s restaurant, where he sold tours of Huế’s historic pagodas and emperors’ mausoleums. I’d spend the morning practising my Vietnamese with the tour guides and restaurant staff. On this morning, the rain pounded so hard I was sure Tuấn would stay home. I’d planned to make a dash for the cluster of restaurants up the road from my hotel. They all served hến clams: cơm hến (with rice), cháo hến (with rice porridge), and bún hến (with rice noodles). I’d opened my door to find Sương standing in a wet circle on the carpet, rain dripping off her poncho, jeans soaked from the knees down. I’d slid into place behind her on her motorbike, hunkering down under the rear flap of her poncho, my legs folded horizontally high above the footrests to keep them dry. It was no use. The rain sprayed up off the road and soaked me all the same. When we arrived at the restaurant, Hà poured hot coffee and explained in English: “Tuấn busy. He say invite you for breakfast. He say you not go out in the rain.” Then she’d offered me beef noodle soup, but Sương suggested we eat cơm hến instead. I told her I’d also tried the tiny clams on rice crackers while visiting Hội An. The waitress had watched, surprised I could eat such spicy food. Like Hà, she’d warned me about stomach aches, but I remained healthy. Sương waved her hand as if shooing a fly. “Trương Định hến is too sweet. 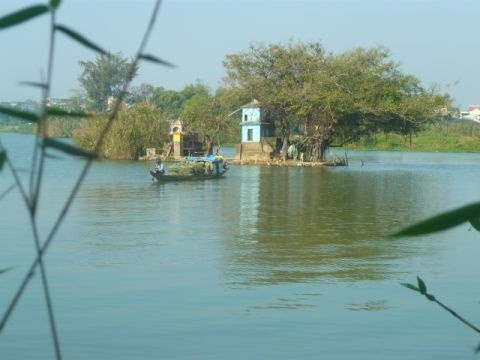 The best hến rice is on Cồn Hến.” She was referring to Hến Islet, which lies between the north and south shores of Huế’s Perfume River, not far from Đông Ba Market. Generations of families have made their living collecting the freshwater Corbicula clams from their alluvial beds around the island, cleaning the pea-sized molluscs and cooking them up. 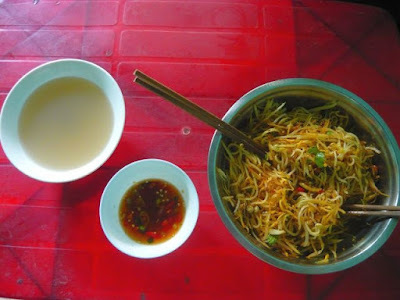 Hà and Sương argued the merits of eating at each location, pitting the three or four restaurants on Trương Định Street against all the cơm hến vendors on the islet. While they usually switched to standard Vietnamese or tried to speak slowly for me, they now peppered their rapid speech with local Huế slang; I struggled to keep up with their argument. I finished my coffee just as the rain was sputtering out. The light reflecting off the high ochre wall across from the restaurant gave the street a golden hue. Sương stood up and grabbed my hand, ending the discussion. “You know how to eat cơm hến, huh? Come with me! Cho vui! (For fun! )” We were on her motorbike for all of three minutes. She pulled over in front of a row of women at a makeshift sidewalk market. Shoe sellers patrolled rows of footwear. Two women squatted amidst stacks of neatly folded men’s shirts. Several more sat on Lilliputian plastic stools, tending steaming food. Sương ducked under a huge green and white umbrella advertising Huế’s Huda beer. A woman in matching short brown tunic and loose trousers was ladling broth from a battered aluminum cauldron. She smiled when she saw Sương. She scooped cold rice into a bowl and topped it with the silvery clams, julienned banana flowers, bitter rau má leaves, coriander, basil and bean sprouts, and pork cracklings. She sprinkled some roasted peanuts and paper-thin chili slices on top, then placed it on a stool in front of me, followed by a bowl of pale broth. Through the fire and sweetness of the sauce, I could taste the musky clams, balanced with the bland, crunchy cracklings and chewy cold rice. Cơm hến is as much about texture as flavour and colour. Each bite had a different ratio of sweet and salty, crunchy and soft. The hot, mild broth offset the cool but searingly spicy clam rice. The rain pattered on the umbrella. We huddled beneath it and I tightened my jacket collar against the chill. I sipped the broth, feeling its warmth spreading from my stomach. We ordered the bún hến next. Though my tongue was growing numb, I discovered another layer: shredded toasted rice crackers. Almost white, they blended in with the noodles, and I didn’t see them right away. We kept eating and listening to the hến woman talk. She was proud of her family business, but hoped her daughter wouldn’t have to cook and sell hến for a living. “You’ll get a stomach ache!” the woman in the next stall warned me, but I hadn’t so far, and I adored Huế’s trio of hến dishes. Crisp, clean flavours that danced on my tongue, and subtle undercurrents too. I added them to my list of addictive Huế specialties like the local beef noodle soup called bún bò Huế, and bánh bột lộc, the translucent shrimp dumplings that I couldn’t get enough of. My time in Việt Nam was almost up (though I would later return to live in Huế for several years). I told Sương I would miss hến rice. Chris Galvin divides her time between Canada and Việt Nam. Her essays and travel writing have appeared in many places online and in print, including Asian Cha, PRISM international, Vietnam Tourism Review, Descant, two Writers Abroad anthologies, and others. Chris is currently polishing a collection of essays about Việt Nam. This essay makes me feel the spice of Viet Nam on my tongue. Love it! Her description makes the setting so vivid, with sights and temperatures and smells and tastes. I would love to go try this myself (although I probably would find it too spicy). Such vivid descriptions of traveling on a motorbike in the rain. This makes me want to be on the sidewalk market trying hến rice. I like how Chris captured the Vietnamese way of asking "Do you know how to eat this?" rather than "Do you like this?" I now have a craving for a bowl of cold rice with the clams and toppings and chilis...I felt like I was visiting the market with you! Such a beautiful description of an amazing sounding dish. I can't imagine the effort that goes in to getting the clams. I am sure it made you appreciate the meal even more. I wanted to eat it myself, so vivd the description of the dish. I have such travel envy! Sounds enticing.... I love the closing line especially about the hen being the heart of the people. Lovely essay. Well-written and engaging. The narrator brings us right there with the local people, and shares so much more than the country's cuisine. Well done. Oops sorry, meant to sign...Paola here! Don't like spicy food but this almost had me wanting to try the dishes Chris mentions. A story of food that tells so much about a country and its people. Loved it. What a charming story. Very well told and I especially liked how you convey the complexity of Vietnamese food with its textures and tastes which are so different. Also enjoyed the photographs. Tried to leave a comment before.....looks like my only option is to leave an "anonymous" comment, because I don't have a blog or a website. It's a flavorfull travel essay......makes me want to drop everything and travel to Vietnam. I am very curious now about this dish. I have never heard of these clams before. So interesting. Oops, forgot to say: Bob says: great work! and good luck! A real taste of Vietnam. Excellent writing and photos. In Hue we love to eat com hen. Maybe not everyone likes it but it is true if we go away from Hue we miss it. Cool beans or rather good com hen.